100 percent non-smoking Welcome to the Hilton Garden Inn Allentown West hotel in Breinigsville PA located in a suburban area just west of Allentown near Kutztown Fogelsville Macungie Topton Fleetwood and Trexlertown. This Allentown hotel is located off Route 100 in Breinigsville with easy access to I-78 US 22 PA 309 and I-476 /PA Turnpike/. We are located within a couple miles of such companies as Air Products and Chemicals Boston Beer Nestle Lehigh Cement Kraft Foods Coca-Cola Fisher Clinical Services and Uline. Our shuttle service operates Monday-Friday and based on availability for guests traveling on business. Popular attractions nearby include Dorney Park and Wildwater Kingdom the Valley Preferred Velodrome the Crayola Experience Blue Mountain Skiing and Coca-Cola Park home of the Lehigh Valley Iron Pigs minor league baseball team the AAA affiliate of the Philadelphia Phillies. We also are close to Kutztown University Lehigh University Muhlenberg College Moravian College Cedar Crest College and DeSales University. Guests can enjoy dining and shopping at Lehigh Valley Mall The Promenade Shops at Saucon Valley Renninger*s Antiques and Cabela*s each only 10 to 15 minutes from this Allentown hotel. Deluxe accommodations friendly service and a relaxed atmosphere await at our Allentown hotel. We offer an array of amenities including complimentary high-speed internet heated indoor pool whirlpool complimentary 24-hour fitness and business centers. Each room features a microwave refrigerator coffee maker two dual-line phones with voicemail a large work desk and on-demand video services. The Hilton Garden Inn hotel in Allentown PA offers 1 330 square feet of meeting space for 80 people. The hotel*s restaurant The Garden Grille and Bar serves freshly prepared breakfast featuring waffles and cooked-to-order items. The hotel has a Lounge Bar a welcoming fireplace and the Pavilion Pantry offering prepared dinners snacks and drinks. 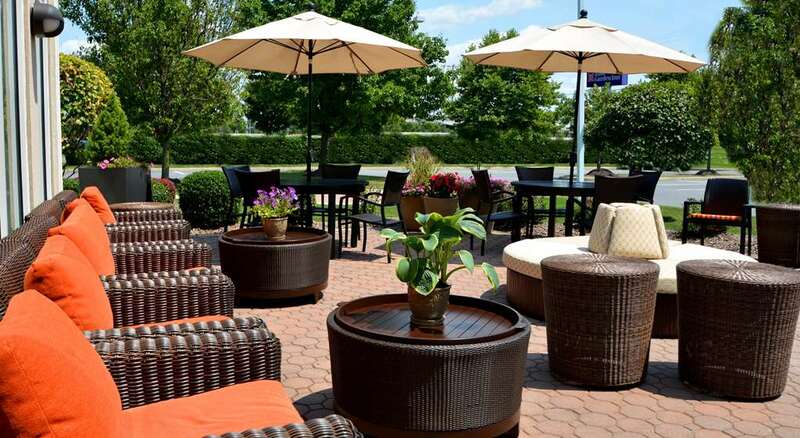 Garden Grille - Bar: Enjoy Freshly Prepared American Breakfasts As Well As Lighter Continental Breakfasts for 11.95. Open Mon-Fri 6am-10am / Sat-Sun 7am-Noon.